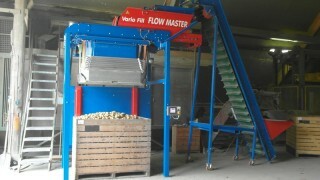 Vario Fill Flowmaster box and big bag filling machine. 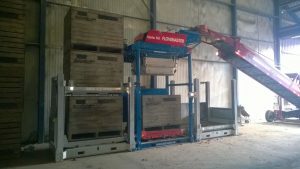 With the Variofill Flowmaster boxes and bigbag filling machine made by Mechatec you are able to fill easily 100 boxes wiht potatoes per hour (125-130tons/hr). 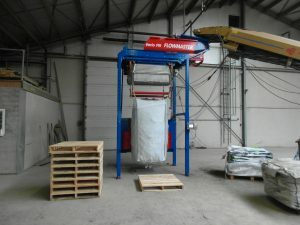 This machine can be used in combination with the Boxmaster but also as a standalone machine to fill boxes and bigbags. Through the unique filling system you are able to fill the boxes without a deposit cone. 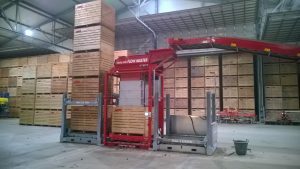 This machine brings a large logistic benefit as less forklift movements are necessary. The thoughtfull machine will save you a lot of work during the most busiest periods of the year. 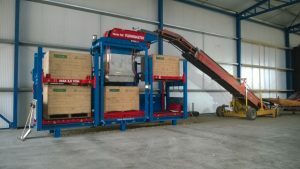 This machine has also the possiblity of shaking the box by a large shaking movement so the product will be layed flat into the box. During the filling with onions you can easily store 10-15% more of the product in the boxes. Please note that your product can handle the shaking. 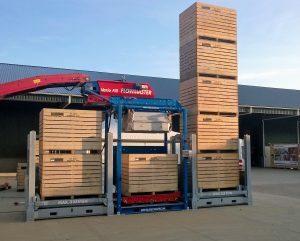 The Variofill Flowmaster can be equiped with a weighingsystem. A numerator for the amount of boxes/big bags is added. This numerator has also the possibility of counting total weight. 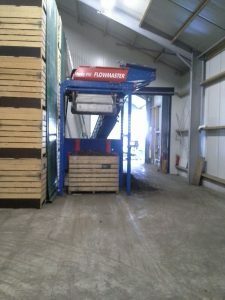 The Variofill Flowmaster stores approx 300 kg of procuct on the above filling cross conveyorbelt. If the storage is full the machine starts with filling the masterbunker. The masterbunker, made of stainless steel segments will be emptied layer by layer so guaranteed no deposit cone is created. It lowers, depedant of the flow step by step and layer by layer. When the required volume or set weight is reached in the bunker the flow will stop from the cross conveyorbelt to the masterbunker (which starts buffering again) and the box or bigbag will be filled. 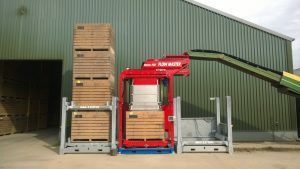 A constant flow is guaranteed and over 100 t/hr can be worked in combination with the stacking system.